Photograph courtesy Andrew Walker 25156 with a train of steel products passes a very active Wath Yard during April 1978. The seventeen year two month career of D7506/25156 included allocations to London Midland Region & Western Region depots. Time between last Classified repair and withdrawal: 49 months. Time between last Classified repair and withdrawal: 5 months. 25156 was the 121st Class 25 withdrawn, on of two retired during December 1981. After withdrawal 25156 was stored at Tyseley until March 16th 1982 when it was moved with 25290 to Swindon Works and broken up there by the end of May 1982. Noted Derby Works September 1972 (full repaint). Noted Glasgow Works October 1977. 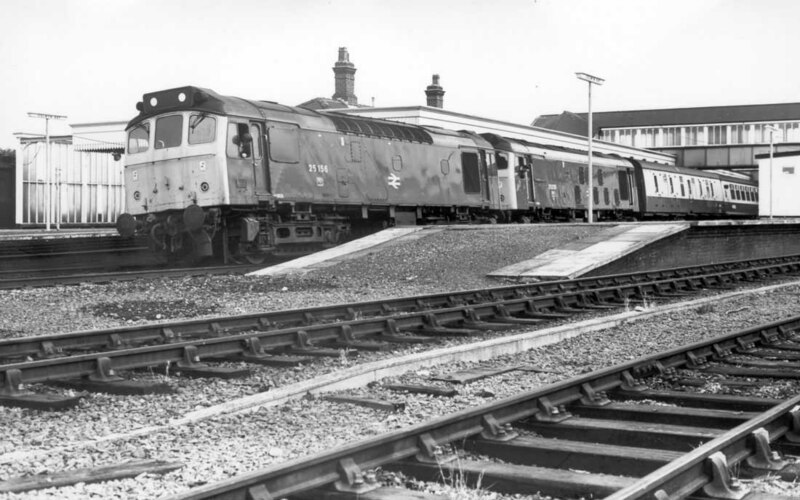 On June 7th 7506 & 7620 were noted on the 13.43 Yarmouth - Derby from Norwich. On May 20th 7502 & 7577 were noted at Long Rock shed whilst 7506 was at Penzance station. On July 2nd 7502, 7503, 7504 & 7506 were noted on Exeter stabling point. On July 17th the 1B99 08.15 London Paddington -	Barnstable was worked forward from Exeter St Davids by 7506 & 7504, the same pair returning to Exeter St Davids with the 1A99	14.40 Barnstable - London Paddington. On July 22nd 17.03 Exeter St Davids - Axminster was worked by 7506 hauling failed diesel multiple unit P580, returning as empty coaching stock to Exeter. The Derby Locomotive Works Open Day on August 26th featured freshly repainted 7506 on display in front of the office building. About a month later on September 23rd an Open Day was held at Laira, amongst a variety of exhibits were 163, 7506 & 6544. On April 23rd 7506 worked the 15.58 Exeter St Davids - Barnstaple and the 17.55 return. On June 16th 7506 worked the 06.15 Exeter St Davids - Barnstaple and the 08.32 return. On arrival at Exeter 7506 was failed and dragged off to the stabling point. The 07.40 Penzance - Liverpool was worked by 7506 & 153 between Exeter St. Davids & Bristol Temple Meads on October 4th. A Hookagate - Newport welded rail train arrived at Hereford behind 40177 on June 14th, 25155 & 25156 took the train forward to Newport, the Class 40 returned northwards light engine. The 12.45 Cardiff - Taunton on July 3rd was hauled by 25156. On July 15th 25156 & 24091 were noted together at Crewe depot, the next day (16th) they worked the 09.40 Euston - Aberystwyth forward from Shrewsbury. The next day (17th) 25156 & 25150 worked the 08.45 Birmingham New Street - Barmouth, returning with the 17.30 Barmouth - Birmingham New Street. A month later on August 21st 25156 worked the 16.09 Holyhead - Euston to Crewe. On June 3rd the 10.40 Euston - Aberystwyth was worked forward from Wolverhampton by 25156 & 25141 returning with the 16.10 Aberystwyth - Shrewsbury. The relief 17.13 Llandudno Junction - Llandudno Town was worked by 25156 on August 13th. Five days later during the early afternoon of August 18th 25122 & 25156 were noted southbound through Craven Arms with a lengthy passenger train. On September 16th a diverted Inverness - Euston stalled on Miles Platting bank, after a considerable delay 25156 assisted the train up the bank. 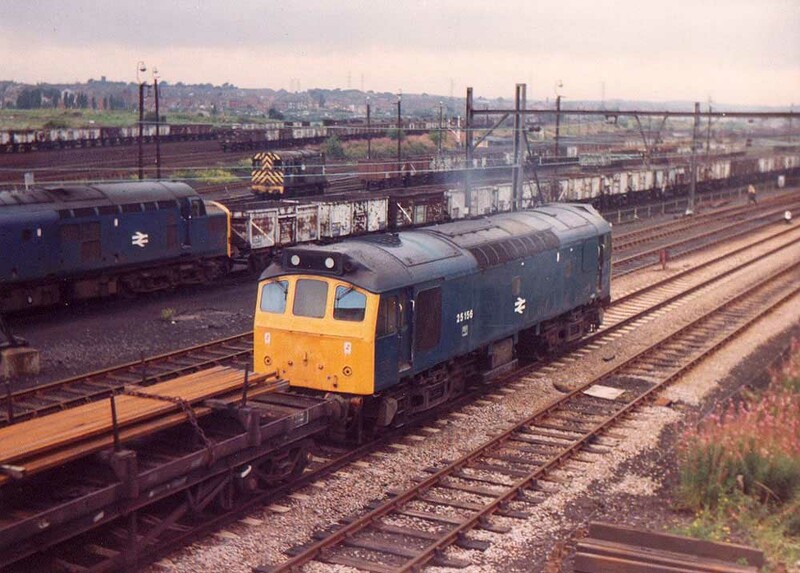 Photograph courtesy Larry Goddard 25156 & 25235 wait time at Colwyn Bay on February 9th 1979. May 5th found 25156 at Hexham with the local pick up freight from Tyne Yard. The last year of passenger workings for 25156 took place during 1981 with the latter half of July producing a variety of turns. On July 18th 25156 worked the 07.35 Nottingham - Llandudno Town and 13.26 return. A week later on July 25th 25156 & 25175 worked the 08.35 Derby - Yarmouth to Norwich, returning with the 14.20 Yarmouth - Derby from Norwich. The next day (26th) the same pair worked a Leicester - Skegness roundtrip. A month later on September 24th 1981 25156 & 25067 worked a roundtrip Leicester - Llandudno Town day excursion, a roundtrip of 298 miles. 25156 was withdrawn on December 21st 1981. Page added August 21st 2013. Last updated April 9th 2019.